In a demonstration of its growing design and engineering capabilities, Hyundai Motor Co. unveiled three brand-new models at the 2007 Seoul Motor Show which opened at KINTEX today. Leading the trio was the Veloster, a sporty coupe which caters to the unique requirements of the Y-generation. Joining the sporty concept car were two production models: the TQ van, a thoroughly fresh interpretation of Hyundai's hugely successful H-1 van and the FD estate wagon, styled at the company's European Design Center in Russelsheim which marks Hyundai's long-awaited return to this popular segment. Styled at Hyundai´s Design and Technical Center at Namyang, the Veloster (codenamed HND-3) coupe is the third in a series of daring concept cars to be developed by the central styling studio in Korea. 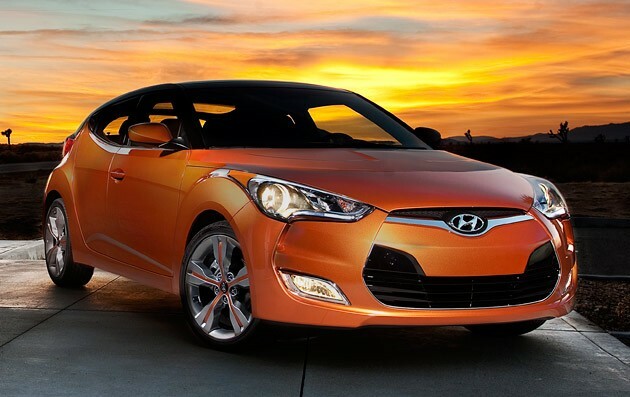 The Veloster name, a compound of velocity and roadster evokes the sporty characteristics of a classic two-plus-two. A panoramic glass roof and other futuristic styling cues help project a high-tech image. Designed to cater to the tastes of the Y-generation, Veloster combines simple, iconic design with good value and robust construction. "With Veloster, we wanted to try something really different. We´re keenly aware that we need radically new products for the Y-generation, the first-time twenties something buyer," said Oh Suk-Geun, Hyundai´s vice president of design. "This is really a bold new direction," he added. The only thing I kinda like about that car is the wheels. Coming from a company that made this car in 94??? I don't think it looks bad at all. Hyundai is really coming on the map. I've never owned one, and have only driven an older one, but the way they're going I wouldn't be against it in the future. Most of you are too young to remember Honda's reputation 30 years ago and how most Americans looked down upon the foreign maker saying stuff like, "They'll never be able to touch an American sports car." Look where Honda is now. Props to Hyundai. The front looks great, the rear looks meh, but overall I like it. i thought this came out before mitsu. no? Hyundai is working on the next generation Tiburon. This may be an indicator of what we can expect to see in a couple of years. Styled at Hyundai’s Design and Technical Centre at Namyang, the Veloster coupe is the third in a series of daring concept cars to be developed by the company’s central styling studio in Korea. The Veloster name, a combination of velocity and roadster, evokes the sporty characteristics of a sporty two-plus-two. A panoramic glass roof and other futuristic styling cues help project a high-tech image. Designed to cater to the tastes of the so-called Y-generation, Veloster combines simple, iconic design with good value and robust construction. Front end takes some cues from the current Mitsu Eclipse....and that is not a good thing. ^ same here. Not really feeling it at all. I like the front. Aside from the mitsu-influenced grille, it's actually pretty original with the whole airdam on the side going under the headlight. Here are the latest spy shots. Apparently, a 210 HP (likely turbo) version is in the works for the European market. Btw, that Lancer grill is just an upturned, oversized Audi grill. some people just can't let go, I guess. it'll also get dual clutch transmission..
if it's anything like the old Saturn Ion, not too many Americans liked the idea. "Power is expected to be from a 2.0-litre 4-cylinder with a choice of manual or automatic gearboxes, and front-wheel-drive. So far, it doesn’t look to be having any aggressive sporting intentions, but that may change in the future." What can I say, sometimes I'm late to the party (anyway, now you know). 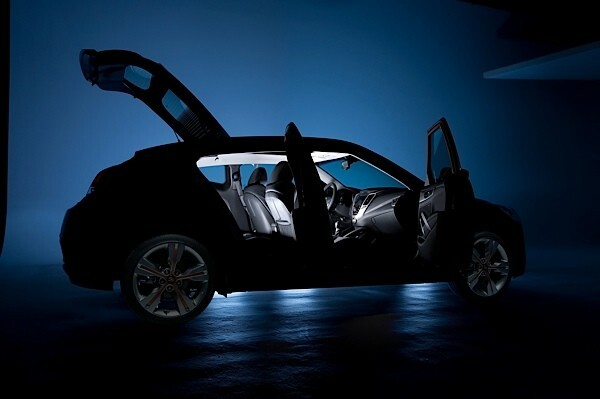 After the usual tease of spy shots and teasers, the sheet has finally been pulled back on the 2012 Hyundai Veloster. Not only does the Veloster take aim at wannabe efficient sports cars like the Honda CR-Z, it reinvents the way we look at the shape of coupes and hatchbacks, employing a unique three-door design that's surprisingly better in execution than we expected. Hyundai is using its 2012 Veloster to unveil a slate of new technologies, including a brand new engine and transmission, as well as the automaker's first foray into the safety and convenience telematics realm with Blue Link. Hyundai is promising class-leading fuel efficiency with a truly sporty driving experience all wrapped in a wholly unique package, but does the Veloster meet the criteria? Follow the jump to find out. Perhaps the biggest question surrounding the Veloster is its unique three-door arrangement. This isn't the first time we've seen extra doors on sport coupes, but Hyundai has chosen to forego the use of rear-hinged suicide doors for an honest-to-goodness full-size door on the passenger side of the Veloster. To maintain the car's coupe-like style, the rear door handle has been integrated into the C-pillar, and you really have to see it in person to understand that it's not nearly as awkward as you might think. Hyundai promises that the Veloster will be agile and fun to drive, employing things like a lightweight V-torsion beam in the rear suspension setup, a 23-millimeter stabilizer bar to control body roll and sport-tuned electric power steering. A quick-ratio steering system has also been fitted, and the Veloster rides on standard 17-inch wheels wrapped in 215/45-series all-season tires. Two sets of 18-inch alloy wheels are available, housed in 215/40-series performance rubber. The Veloster is powered by Hyundai's all-new 1.6-liter Gamma inline-four which produces 138 horsepower at 6,300 rpm and 123 pound-feet of torque at 4,850 rpm. No, it isn't a particularly potent engines, but it should be plenty to move the 2,584-pound Veloster along at a decent clip. Through the use of direct injection, Hyundai is able to make this mill surprisingly efficient, and while official EPA numbers haven't been released just yet, Hyundai claims that the Veloster will net around 40 miles per gallon on the highway, easily besting the Honda CR-Z hybrid and even smaller B-segment offerings like the Mazda2 or Honda Fit. The standard transmission is a six-speed manual, though an all-new six-speed dual-cluch transmission is available. Inside, Hyundai provides a host of newfangled technology, including a standard multi-function seven-inch touch-screen display with Pandora internet radio, Gracenote music display, video playback, video game console connectivity (yes, you read correctly – video game console connectivity) and, of course, Bluetooth. How's that for trying to capture the youth market? Of course, Hyundai's usual host of safety equipment is still on deck, with the new Blue Link telematics system that encompasses things like automatic crash notification, enhanced roadside assistance, remote door and vehicle start, and convenience features like voice text messaging, vehicle diagnostics information and a range of navigation features. 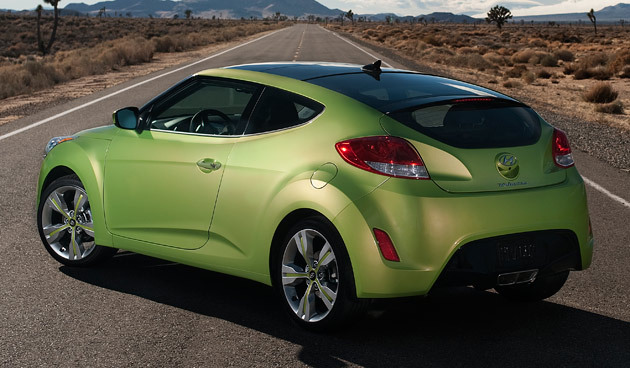 Pricing has yet to be announced for the 2012 Veloster, but in keeping with Hyundai's quest for affordability, we'd assume that the starting price for the new sports coupe will be found somewhere in the sub-$20,000 range. For the full details, check out Hyundai's official release below. That's a whole lot of ugly. it's like they were on cruise control and a deer popped up and the gravy train just came to a dead halt. This car had a front end that looks like the GTR, in my opinion. Also for a fact, the passenger door is a copy of the Acura ZDX unless other cars have done this before. Where the door handles blend in with the door at the top corner of the door in black to make it look like a Coupe.